The Milking Parlour - can we feed the planet without it costing the earth? An innovative art exhibition ‘The Milking Parlour’ will be arriving at Dorset County Council’s Fine Foundation Gallery at Durlston Country Park on Saturday 19 November. It will explore our relationship to milk and the environmental impacts of our farming system. 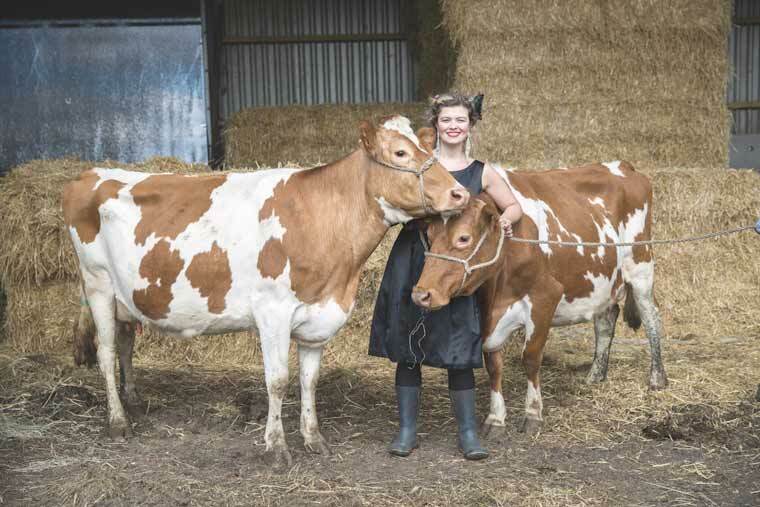 Nessie Reid, Cape Farewell’s Rural Artist in Residence, lived with two pure-bred Guernsey cows in the centre of Bristol’s Anchor Square for four nights and five days for the Milking Parlour live show – a culmination of her intensive two-year research residency exploring the UK dairy industry. The show caught the attention of the general public and was featured on Jeremy Vine’s Radio 2 show, Radio 4’s On Your Farm and live on BBC News. Following this, she is now touring the ‘dry’ show across the South West, bringing the results of this provocative immersive exhibition. It includes a specially commissioned documentary covering the show and its impacts and a chance to read the thousands of comments from the general public who responded to the issues. As industrialised agriculture is one of the largest contributors to climate change, there are questions that have to be asked, and urgently. The Milking Parlour has been designed as an on-going platform to discuss and explore questions, such as: how do we feed the planet without it costing the earth? Can we still eat meat and drink dairy, and live sustainably? Food is complex and the choices we make on a daily basis shape our current food and ecological system. The exhibition runs from 19 November–8 December at Durlstone Country Park from 11am–4pm.